MLKL pS345 is a trigger for necroptosis. It is only detectable in infection/cellular damaged (PMID:29229989) or aging tissue (PMID: 28807105) but not in normal tissues. Synthetic peptide (the amino acid sequence is considered to be commercially sensitive) within Mouse MLKL aa 300-400 (phospho S345). The exact sequence is proprietary. WB: L929 whole cell lysate treated with 20 ng/ml TNF alpha (ab9642), 100 nM Smac mimetic, and 20 µM z-VAD (ab120382) for 8h and then harvested. 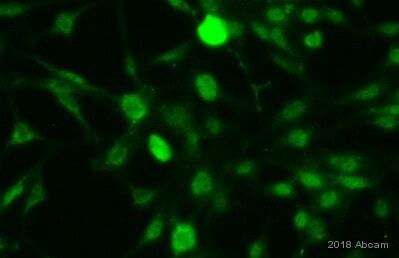 IP: L929 whole cell lysate treated with TNF alpha (ab9642) + Smac mimetic + z-VAD (ab120382) compound for 8h. ICC/IF: Mouse cardiomyocytes. Our Abpromise guarantee covers the use of ab196436 in the following tested applications. Lane 2 : L-929 whole cell lysate treated with 20 ng/ml TNF alpha (ab9642), 100 nM Smac mimetic, and 20 µM z-VAD (ab120382) for 8 h and then harvested. 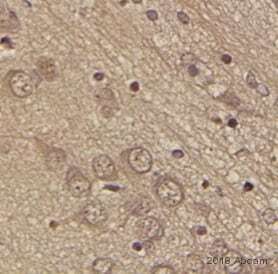 Ab196436 staining MLKL in mouse cardiomyocytes by Immunocytochemistry. Samples were fixed with paraformaldehyde, permeabilized with 0.03% Triton x-100 and blocked with 1% BSA for 1 hour at room temperature. Samples were incubated with primary antibody at 1/100 dilution for 12 hours. An Alexa Fluor® anti- rabbit was used as a secondary antibody at 1/200 dilution. MLKL (phospho S345) was immunoprecipitated from 1mg of L-929 (Mouse connective tissue fibroblast cells) whole cell lysate treated with 20 ng/ml TNF alpha (ab9642) + 100 nM Smac mimetic + 20 µM z-VAD compound (ab120382) for 8h using ab196436 at 1/150 dilution. 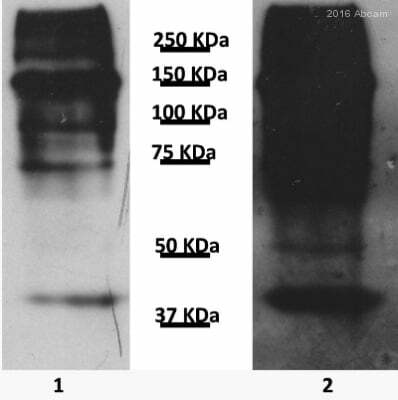 Western blot was performed from the immunoprecipitate using ab196436 at 1/1000 dilution. Anti-Rabbit IgG (HRP), specific to the non-reduced form of IgG, was used as secondary antibody at 1/1500 dilution. Lane 1: L-929 whole cell lysate treated with 20 ng/ml TNF alpha (ab9642) + 100 nM Smac mimetic+ 20 µM z-VAD compound (ab120382) for 8h;10 µg (Input). Lane 2: ab196436 IP in L-929 whole cell lysate treated with 20 ng/ml TNF alpha (ab9642) + 100 nM Smac mimetic+ 20 µM z-VAD compound (ab120382) for 8h. 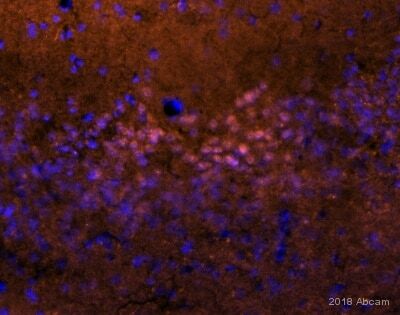 Lane 3: Rabbit monoclonal IgG (ab172730) instead of ab196436 in L-929 whole cell lysate treated with 20 ng/ml TNF alpha (ab9642) + 100 nM Smac mimetic+ 20 µM z-VAD compound (ab120382) for 8h. Dot blot analysis of MLKL (phospho S345) peptide (Lane 1), and non-phospho peptide (Lane 2), labeled using ab196436 at 1/1000 dilution, followed by Goat Anti-Rabbit IgG, (H+L), Peroxidase conjugated secondary antibody at 1/1000 dilution.